Holy Shrimp! 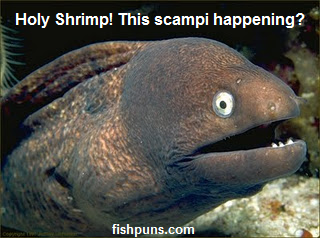 This Scampi Happening? Kindly Donated By Dave Larsen. Nice one Dave. I trout you buoys and gils would mak-o it on Comedy Central . Any fin is possible if you don't trout yourself! This is seariously the best site ever! Not even squidding! I don't know what you guys are talking about, this site is brill-iant! We, the jury, find the defendant gillty of terrible fish puns! What's this fish pun website you've been herring all about? Coming up with a new fish pun every day is a right pain in the bass! Have you got a fish pun? Or do you need more time to mullet over? Create your own fish pun, don't leave it to salmon else. Why don't you trawl through our site?